SIX AWESOME RESTAURANTS COMPETE TO WIN "BEST BURGER"! Exciting Presentation with All Registrations, with sign language interpreter. Upbeat, with dynamic speakers and short videos. • New discoveries and surprising vegans everywhere! • Share the joy and positive benefits of plant-based foods and lifestyle. • Enjoy all our food favorites and navigate challenges. Speakers: Ruby Lathon (Roadmap to Holistic Health), Greg Brown (Land of Kush), Crystal Forman (Holistic Wellness & Health), and Marley Daniels-Smith, youth guest speaker. YOU DON'T WANT TO MISS THIS PRESENTATION! • Enjoy scrumptious, plant-based mini burger-sliders designed for a wide range of preferences. 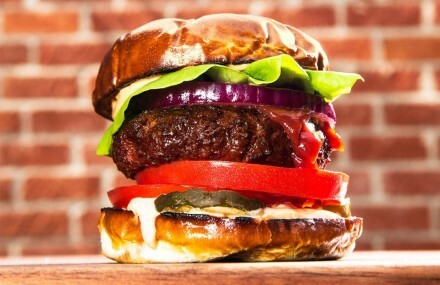 • Custom-crafted burgers bursting with flavor, made from whole and blended plant foods that delight and satisfy. and a Just-like-beef Impossible Burger you won't believe is plant-sourced! • Receive tokens for burgers included with ticket purchase. • Purchase tokens for burgers, side dishes, and drinks. Posters of all foods with ingredients will be published on the event website, at check-in, and at each food station. • Organizations that provide underserved people with access to affordable, healthy food: Thrive Baltimore and the Food Empowerment Project. • BotaniCuisine's restaurant outreach and educational outreach efforts. • Must pre-register so vendors know how much food to prepare. Very limited tickets at door. • All tickets include burgers. • Biodegradable food tray with compartments, 8 1/2" x 12"
• Admission for one person. • Two (2) burgers, each from different vendors. Tokens provided at check-in, selected randomly. You can choose among remaining tokens. • Admission for one kid. • Food for purchase in kids' area. Burgers not included. • A burger from each vendor. • Six (6) raffle tickets. • Admission for two people. • A burger from each vendor, to share. • Pre-registration purchase only. Limited tickets available. • Six (6) burgers, one from each vendor. • Private seating area with staff to serve your food, no waiting in lines. • May stay for entire event. • $5 of ticket price donated (in addition to overall event proceeds) to organizations which help provide underserved people with access to healthy food: Thrive Baltimore and the Food Empowerment Project. • Bring a photo ID to exchange your tickets for an event voucher. • A list of all registrants will be available to confirm ticket payment. • Exchange ticket for burger tokens at door; exchange burger tokens for burgers at each vendor. Unless in the very unlikely, probably-impossible case that the event is cancelled, all tickets will be fully refunded. Burger photo, below, Is similar to burgers sold at this event.